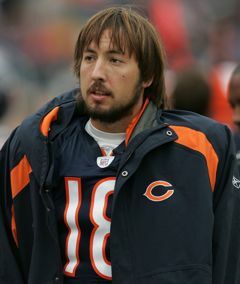 Okay, okay, we know the Denver Broncos got a bevy of draft picks for their young, tempestuous quarterback, Jake Cutler, in addition to Bears starter Kyle Orton. The Broncos received the Bears first round pick, this year and next, as well as a third rounder this year. The Broncos now have five picks in the top 85 for the 2009 draft, that is something to build around. The way their defense looked last year they'll need them. The Clarion Content has been a vocal critique of Jay Cutler and his braggadocio. Who cares if you think you can throw farther than Elway, Jay, if you can't beat Phillip Rivers when it counts? We were not surprised to read that Cutler has the same agent as Brett Favre. He was a reportedly an arrogant pain at Vanderbilt and his NFL career has been no different, despite his Pro Bowl status. Cutler strikes us as cut in the mold of Jeff George. The guy the Broncos got back couldn't be more different. We have been an Orton supporter since back to his days at Purdue where he followed Drew Brees through Joe Tiller's sophisticated passing offense. The Denver Post is already writing about Orton's positive attitude and work ethic. (Cutler was known for his lackadaisical practice habits.) They also note for the record that, "Orton was 21-12 as a starter with the Bears, including a 15-2 record at home. Cutler was 17-20 for the Broncos, 10-9 at home. " The Bears are heading in the opposite direction from the Broncos with this trade, mortgaging their future for the now. It makes some sense, their vaunted defense, anchored by Tommie Harris and Brian Urlacher, isn't getting any younger. They are going with their win-now plan in a comprehensive manner, too. They signed recently released Ram veteran left tackle, Orlando Pace. Word is they have talked about bringing in former St. Louis wideout, and aging star, Tory Holt. They need the help there too, a converted DB/punt returner, Devin Hester, led the team in receiving last year with a measly 665 yards.